The problem with M. Hugot's equation is that is a function of the square of the mill speed, which means mathematically that the mill capacity will increase with speed, reach a maximum and then deacrease, as the speed increases. This could be interpreted in an engineering sense that the mill will have an optimum speed to operate at beyond which the capacity deacreses due to slippage of bagasse in the mill. 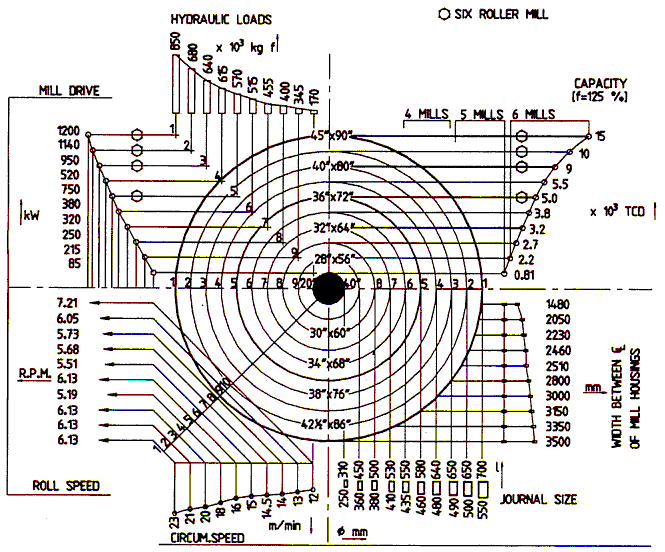 It does not seem prudent to design the mills so that the capacity could be in the decreasing region. The online calculator below uses data gleaned and adapted from the graph supplied by Walkers in Dr Rein's book Cane Sugar Engineering and from the skoda.cz nomogram below.